Blanch the tomatoes to remove the skins. Place tomatoes in a food processor or blender and liquefy. You may remove the seeds if you wish, I keep them in. Add the olive oil to a pan and heat over medium heat. Add onion and let slightly brown. Add garlic and let cook for approximately 30 seconds. Take the pureed tomatoes and add to the onion and garlic. Make sure that you use a pan with a large surface area. It helps to make the sauce reduce. Turn the stove down to low. Allow the tomato sauce to cook until thickened, approximately an hour to 1 1/2. The sauce should be very thick and have reduced a great deal. Salt. After the sauce is done make your pizza! I cook my pizza on a pizza stone at 425 degrees for 20-25 minutes. 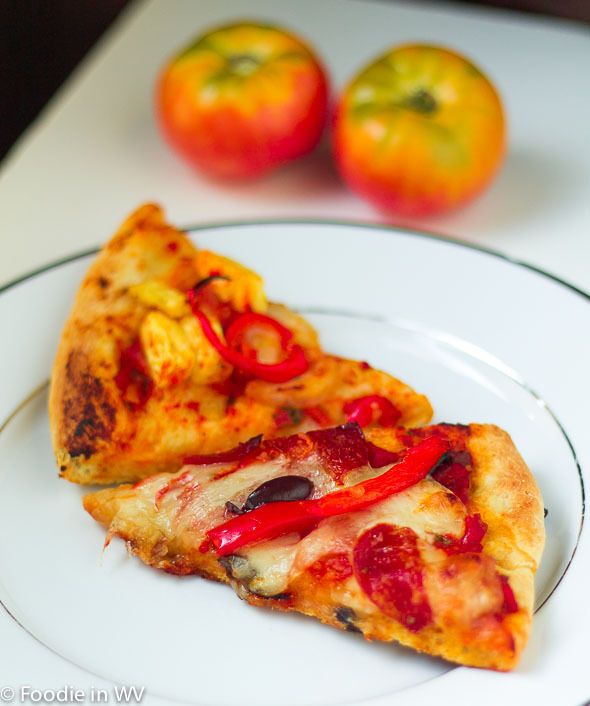 Of course I make a gluten free version for myself, since I can't have regular pizza crust :) That's it, it has a great sweet taste that is perfect for pizza. Pizza is one of my favorite things too, so yummy! My tomatoes were bountiful this season ( unlike last season) and I made tons of tomato sauce this season to freeze. This pizza is a beautiful way to use good homemade tomato sauce. Love it. There will always be rude parents and kids. Don't sweat it. There are still plenty of parents who teach their kids to be polite and respectful. I've made a ton of tomato sauce too. Our season started a little late, but now I have a bunch! That pizza looks so yum! I haven't tried making a homemade tomato sauce yet. It's really easy and so much better than store bought! On a lighter note, your heirloom tomato pizza sauce looks amazing. I'm still waiting the tomatoes in my garden to ripen. They seem taking forever to turn red this year. :) Can't wait to give this a try. I agree that they seem to not have the same manners, I hope maybe it will change and our kids will be raised differently. Mine took a long time to ripen too since we had so much rain in May and June. Oh wow, I ALWAYS get my kids end of the year gifts, as well as gifts at Christmas time. I also get the bus driver gifts, too. I am pretty sure it's customary around here and honestly, those teachers deserve it. My mom always made me get my teacher end of the year gifts because it was a nice thing to do and almost all children in my classroom did the same. I don't have kids and I don't know how things are nowadays but it seems that people are too busy to think about being nice I guess. I love your sauce, my mom makes sauce every summer and keeps it for winter in the cellar. She always did this, especially when I was very little, nowadays she doesn't find the patience anymore. It has always been a great treat and it gives a great flavor compared to the one you buy. She makes all kinds of sauces, very salty ones, sweet ones and even combines them with peppers, garlic, onions, etc. We also have a thing called zacusca which is a kind of eggplant paste with tomato sauce, peppers and sometimes even rice or mushrooms. You can spread it on bread or eat it alone. It's a cool veggie treat in the winter and can be kept for many months in sealed jars. My mother raised me the same way :) I think a lot of people younger than me might have been raised a little differently or ignored their mother's advice. I can my sauce too. It's a great way to have fresh tomatoes in the middle of the winter. It does take a little bit of work though. My mom stopped cooking as much as she got older too. It was just too much work. Well, I don't think you're mean at all. I hold people to a high standard myself. It usually means I end up feeling disappointed with most of them, but that's okay. I expect a lot of myself and I think others should as well. I think your sauce sounds great! I usually use pizza sauce from a jar but when I make a really special pizza, like a deep-dish from scratch, I like to make the sauce too. I think I end up being disappointed with most people as well :) Every once in a while though I am surprised, which is great! Thanks :) It turned out really great! It seems we were brought up in the same way. As a teacher myself, a little thank you goes a long way. When I used to take students on camps it was always interesting to see if we got more than 2 thank yous from parents. After all we had taken care of their kids for 5 days and kept them safe. I did the job because I loved it and didn't expect praise etc but somethimes 2 words like Thank You mean a lot. I loved what you did. I now work 3 days a week in a high school and we have a loback into these kids. Times have changed. On a positive note, you sauce looks amazing. The above comment was from Mum on the Run. This pizza sauce really looks great!!! 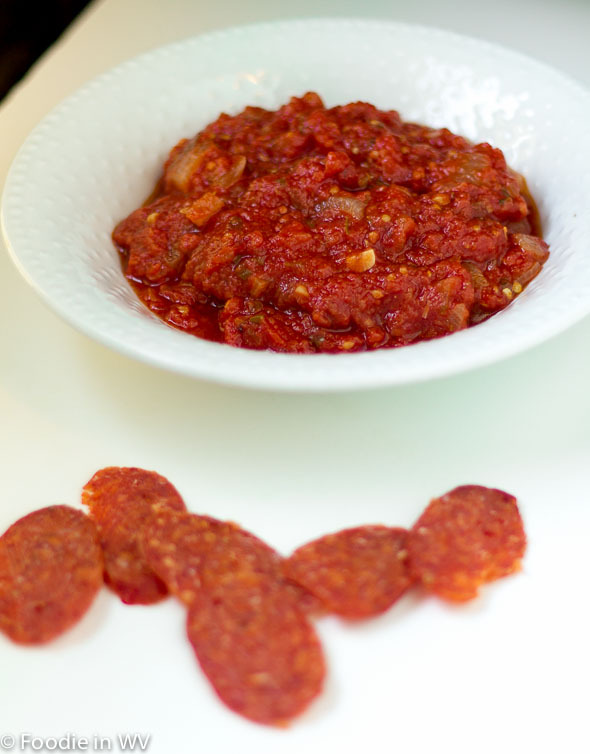 I love making my own pizza sauce but usually use packaged tomato paste. Next time I will be doing my sauce per your recipe including the fresh tomatoes. Thanks :) Fresh sauce really is easy and tastes delicious! You are not mean and your expectations are not too high. Unfortunately, many young people have not been taught manners. On the other hand, your pizza sauce -- and your photos-- look fabulous. I hope that my kids grow up to have great manners, I work hard to make them understand it's important :) A little bit goes a long way! This pizza look wonderful Ann! Thanks :) I am a huge fan of homemade pizza too! I don't think you're mean at all. It does seem like the younger generation has lost a lot of respect. Your expectations isn't too high either. Your pizza sauce looks and sounds delicious. I totally agree with you about the younger generation lacking politeness, class, and respect nowadays. Blame it on the parents of today. The pizza looks delicious with your fresh sauce. I do totally blame it on the parents :) Even though that probably sounds mean! I don't think you are mean or expecting too much at all! It is insane how much times have changed and the lack of respect that the younger generation has. I guess it has to do with the lack of good parenting and the sheer desire to care. It happens with adults too... Some people cannot even say thank you when you hold the door for them. Keep doing what you are doing and raise your kids right so that you KNOW they wouldn't dare brush by someone without saying excuse me! My dad is always complaining about opening the door and ten people walking through without saying thank you. I am definitely raising my kids the same way I was raised. Teaching respect is a big thing in my house! Your sauce sounds delish by the way!! Thanks :) It was a great way to use heirlooms! This is now on my list to try. We love pizza here and making it is great as it tastes better and you also get what you want on it. It does taste better, I agree!